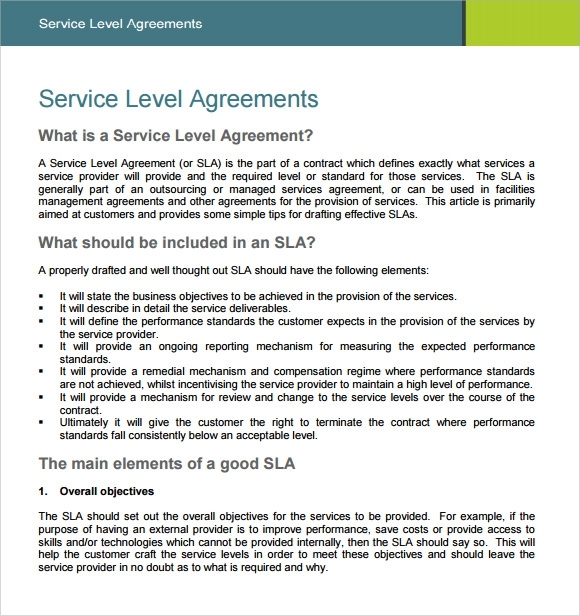 A Service Level Agreements, also known as SLA, is a contract between the service provider and the end user. The format usually includes output based material for example what will be the level of service provided and what will be the course of action in case that level is not matched. There are different types of SLAs for different types of businesses. All such samples are available here and can be downloaded for free. As the SLAs include complicated factors like Time Service Factor, Turn around Time, etc. Our SLA agreement templates will be of great use to organizations that deal with internet provision, cloud computing, Outsourcing, etc. 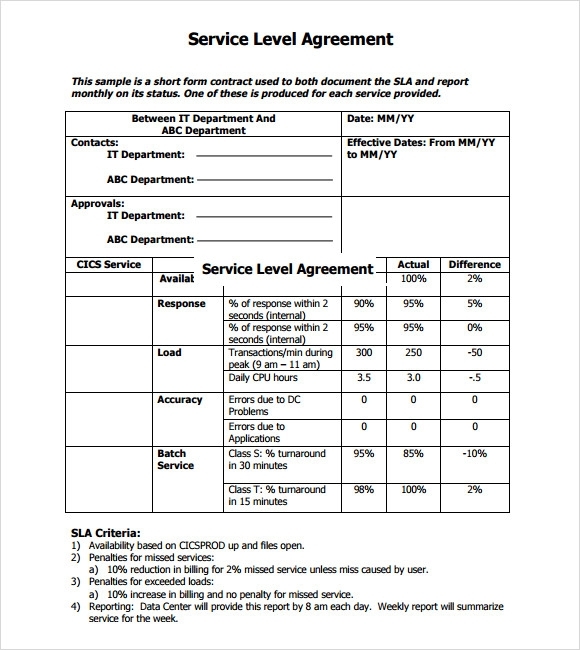 The service level agreement PDF template can be used for detailing the service level that a company will be providing or performing under an agreement. This template can also be used for avoiding costly legal misunderstandings with clients before they actually arise. 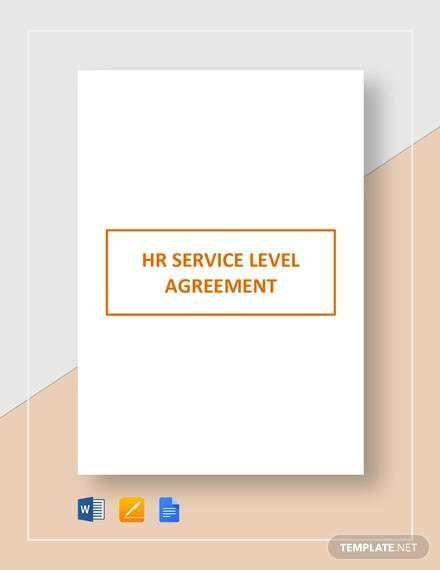 The sample service level agreement template helps in presenting the details of the agreement signed between a company and a client pertaining to the service level that shall be offered by the company. It works in the form of a sample providing the service level offerings of an organization. 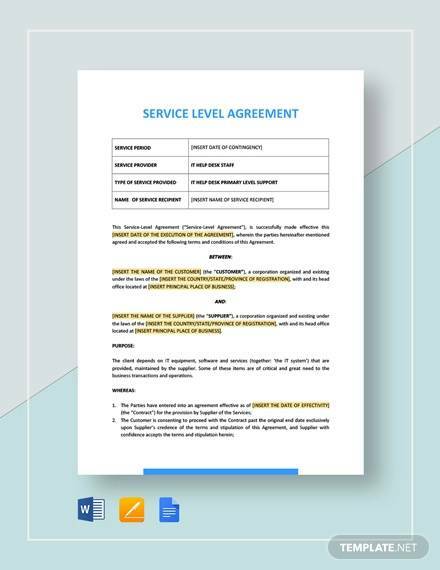 The service level agreement example template presents the example of the service level agreement that a customer and a company gets into. 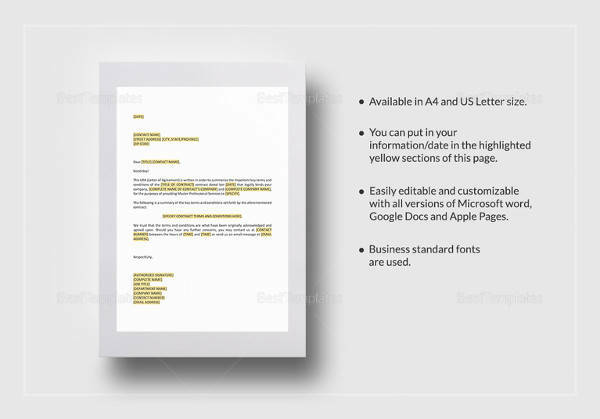 The template can easily be downloaded and conveniently be printed for getting the best results in detailing the service level of a company. 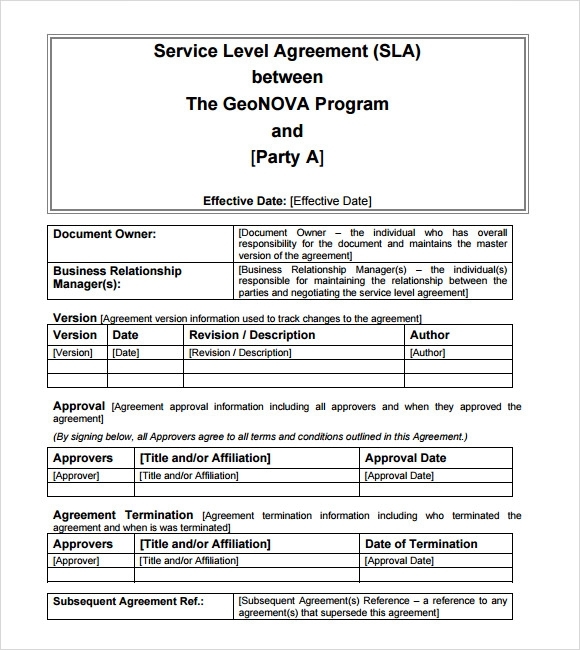 The service level agreement format template presents the format of the service level agreement signed between a client and a company. It not only presents the format of the agreement but also carries separate space for filling in the details of the agreement. 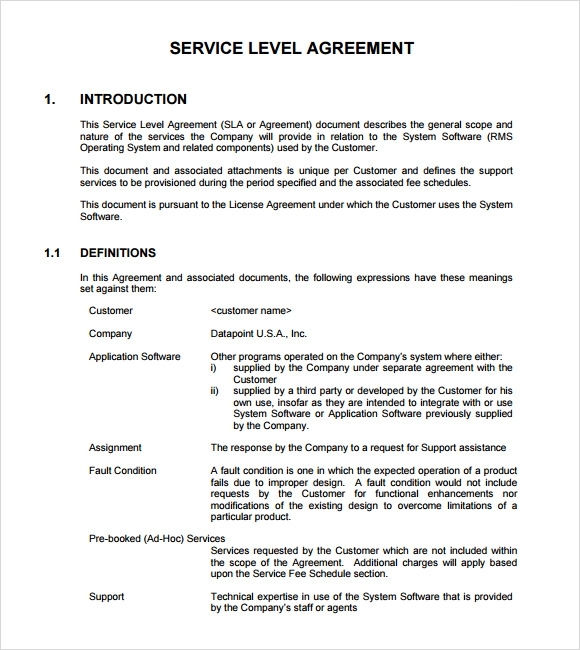 Why Does a Company Need Service Level Agreement Templates? 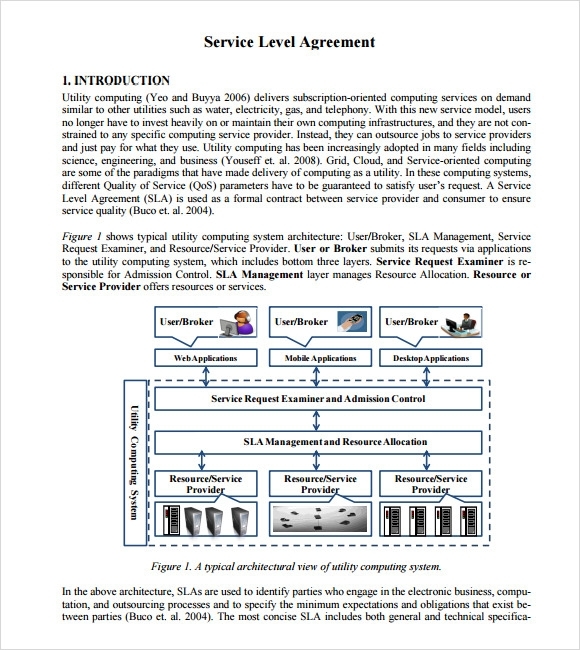 Service level agreements are also called SLAs and they are contracts between the end users and the companies that provide different types of services. These agreements are made in special formats that include the service level that would be offered by the company or the service provider along with the course of action followed by the service provider in case the service level promised does not match the expectations of the end users. There are different varieties of service level agreements meant for different varieties of businesses. 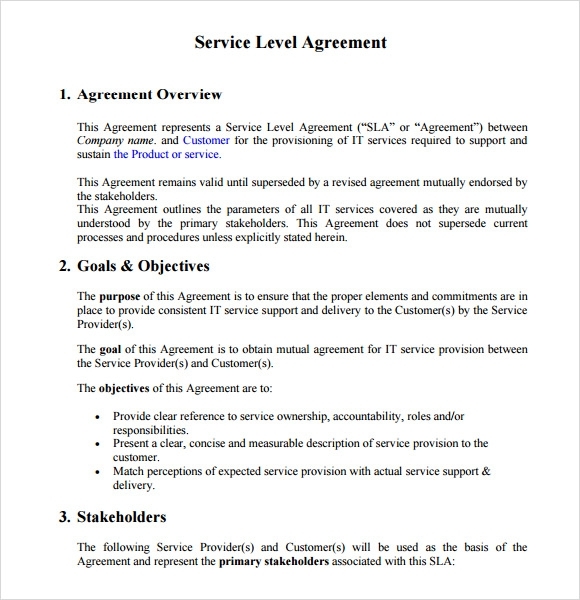 The service level agreements templates can serve to be of good use for organizations and companies dealing in cloud computing, internet provision and outsourcing. 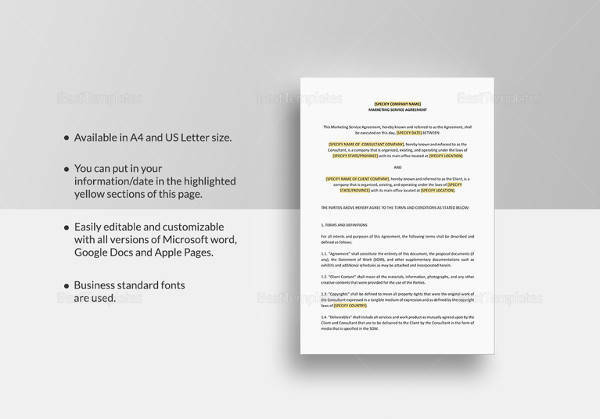 You may like Service Agreement Templates. 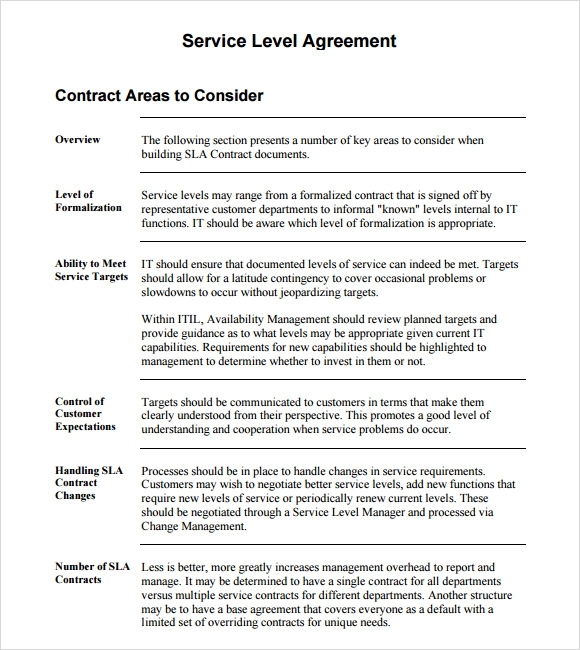 When Does a Company Need Service Level Agreement Templates? 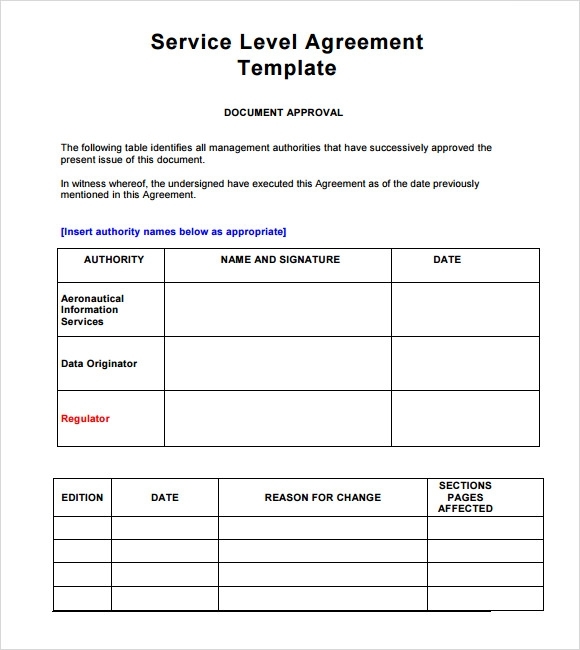 Companies generally require service level agreement templates when they need to come up with an official commitment or statement detailing the level of service that they will be offering to their customers. 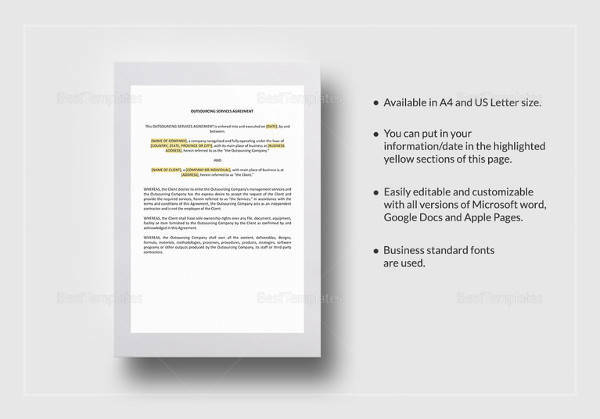 These templates are of good use when companies need to detail the different aspects of their service like quality, scope, responsibilities and availability. 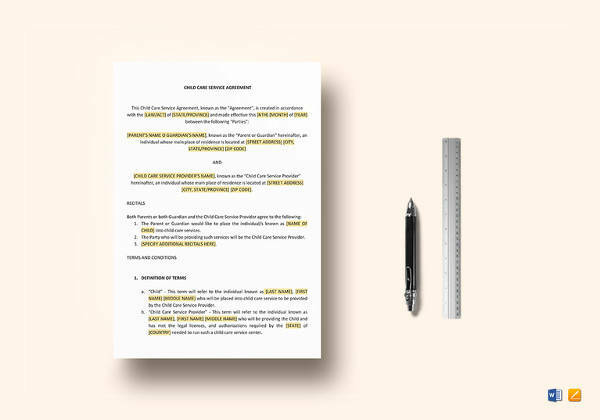 The companies always need to adhere by the terms and conditions detailed in the service level agreements and therefore using a service level agreement template ensures that everything would be out up in the right place. You can also see Master Service Agreements. What Are the Benefits of Service Level Agreement Templates? 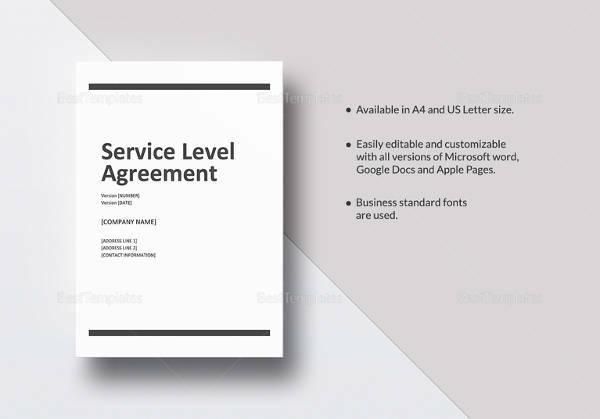 Service level agreement templates are available in different sizes and shapes. They appear in the form of proper or standard documents that can easily be customized for meeting specific requirements. 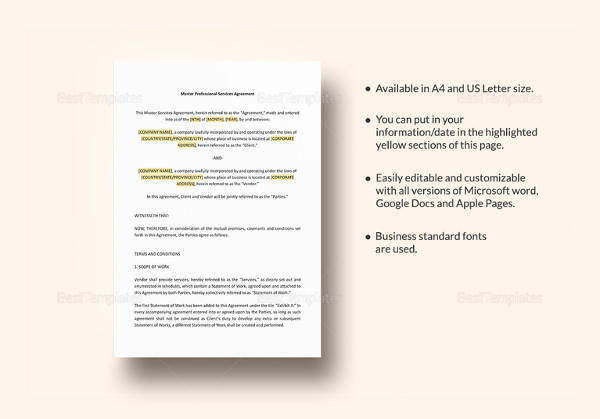 These templates can easily be downloaded and printed and can effectively be used in business and changed specified areas for suiting your requirements. Service level agreement templates are needed for defining the relationship that exists between a company and its end users. It guarantees the end users a specific level of good service offering the clients a satisfaction that in case something goes wrong, they will get immediate response from their service providers.